The weekend flew by - but weekends always seem to these days. I think we finally finished everything connected to the 'House Project' which started back in early March!! Yes, three months of big and little things. And the big project, the one that sucked up 3 hours of Sunday: the basement project. Specifically, what we call the 'green room.' It's not the main basement TV area, nor is it the guest room, it's the room under our sunroom that we have used as a 'junk' room. If we don't know what to do with something, it goes in the green room. But one day I decided I wanted a 'craft table' for when I scan photos, work on the genealogy project/scrapbook, clip and file recipes, etc. So the guest bed in my office had to go to the green room to make room for such a table. Then I ended up getting a new, bigger, L-shaped desk, so my old desk went to the green room. This past weekend we finally set up the bed and added sheets and blankets and a comforter for guests this coming weekend. We also rearranged the miscellaneous furniture in the green room to try and make a nicer, more inviting additional guest room. We hung pictures that had been hidden in a closet. PLUS we re-organized and moved A LOT of stuff around between the laundry room, cedar closet, and green room. Actually, SP moved it all. I supervised and told him what to do. Do you have any idea how many board games SP owns? A LOT. I once counted and I think it was between 60-70! I think it's ridiculous, but he is very attached to his board games and points out that he's been 'collecting' board games for a very long time. We moved them out of the cedar closet and into a more accessible pantry-like storage closet we got at Target. That's a lot of games to move! We found a lot of stuff that we could throw out. It's amazing what you pull out of the nooks and crannies of closets and shelves and rooms!! The garbage pile is HUGE. The trash guys are going to love us tomorrow!!! But I am much happier with how everything looks/is organized. SP could care less - whatever makes his wife happy and non-complainy makes him happy. As long as I don't 're-organize' his 'man cave' area (TV and XBox & guitars & other gaming stuff). 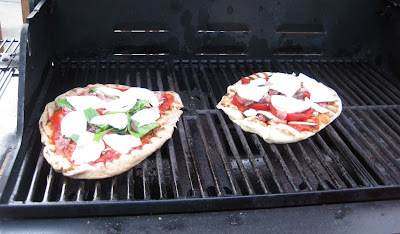 So it wasn't until 6:30 Sunday night when we finally got around to dinner: grilled pizza. When we got back upstairs from our basement 'fun,' we realized it was 81 degrees upstairs and pretty darn stuffy, so we put the a/c on, fired up the grill, and grabbed our 2 pizza doughs from the refrigerator. While SP divided and stretched the doughs into pizza crusts, I chopped our toppings: capacola, prosciutto, kalamatas, portabellas, tomatoes, basil, arugula, spinach, and mozzarella, parmesan. Grilled pizza seems to work best if you grill the crust for a bit, remove it from the grill, add the sauce & toppings, and then return it to the grill to melt the cheese and finish cooking through. 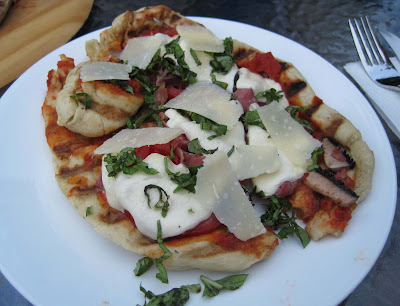 Sadly, SP had difficulties removing my pizza from the grill with the paddle. 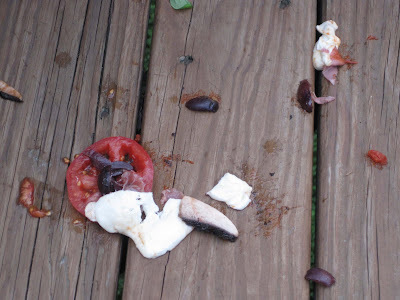 Here's how it looked when plopped directly on my plate: Here's where part of my pizza ended up: On the deck. Look at that! 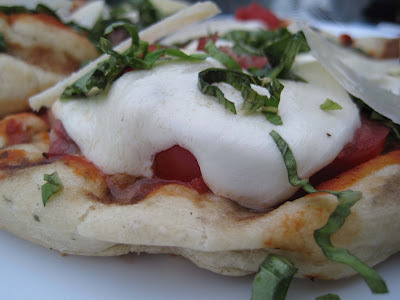 The tasty fresh mozzarella, not pre-shredded stuff, plus kalamatas and lovely, red, juicy tomato - splatted on the deck. There you go ants and raccoons - enjoy! 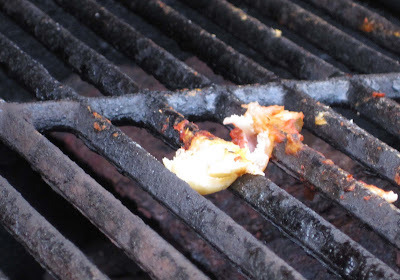 It wasn't enough to splat my cheese on the deck - some of it got left behind on the grill: Here's how his pizza looked: Nice. Pretty. Round. Nothing left behind. Hmmm..... Funny how his pizza turned out so terrific... Payback for making him slave away in the basement???? Mine looked a little prettier after I sprinkled on some basil and parmesan: It tasted great, it was just kind of mangled and required a knife and fork! Mmmmm all that good cheese, fresh basil, prosciutto. 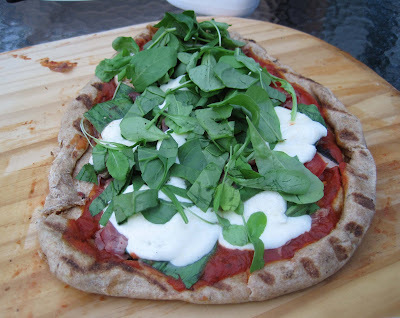 There are fresh herbs (basil & oregano) in the crust, but for some reason they never seemed to show up in the photos I tried to take, and I was so hungry that I didn't feel like taking too many photos. I just wanted to eat! A delicious dinner, out on the deck for the first time this year, there weren't any annoying bugs swarming around, it was cooler on the deck than in the house, and I had a glass of freshly brewed iced tea with freshly made mint simple syrup. A wonderful end to a crazy busy weekend. 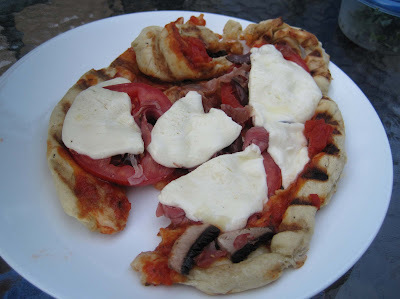 Ohhh, how I love prosciutto on pizza. 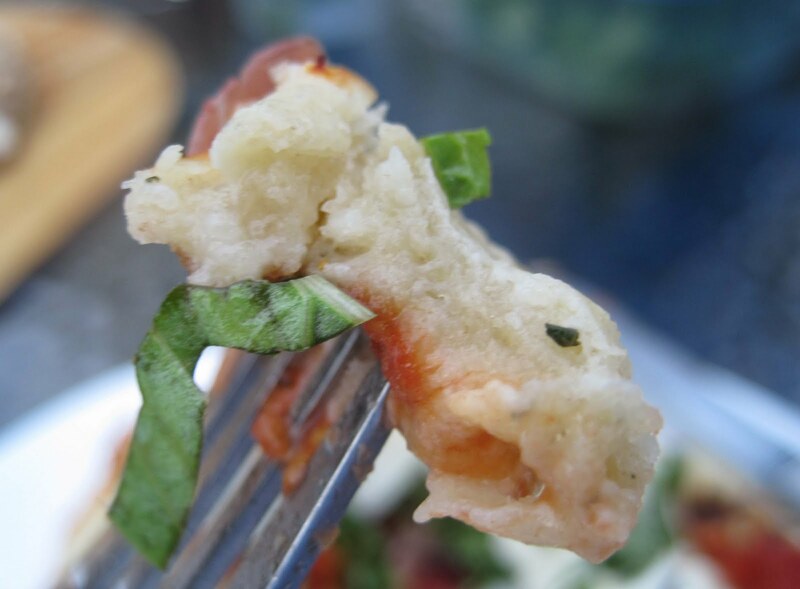 Something about the saltiness mixed with the smokiness of the grilled dough... I really need to get a grill.